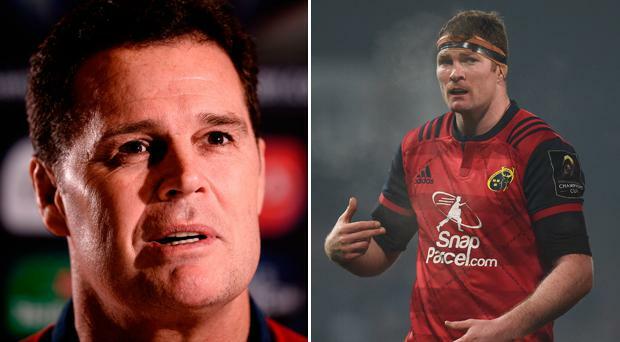 Munster director of rugby Rassie Erasmus has admitted that he has held “formal and informal” talks with the powers that be in South Africa about a potential move home. And while he insisted that nothing has changed with regard to his contract with the IRFU to serve for three years as Munster director of rugby, his answer to questions about mounting speculation he is to return to his old job with his home union won’t ease concerned members of the Red Army. The former Springbok was keen not to dwell on the topic for fear of distracting from preparations for Saturday’s European Champions Cup quarter-final against Toulouse. But after making a huge impact since coming on board, Munster fans will be fearful that their top man could be lured home. “I worked and lived in South Africa as a coach for 16 years and I speak to them weekly, on a formal and informal basis, but at this stage I have a full contract which is three years and it's just speculation,” he said. “I’m big friends with the current coaches and management team. “There's been formal and informal chats the past few months. Some have been requests, some have been pure chats. Although Donnacha Ryan’s departure to Racing 92 has not yet been confirmed, Erasmus effectively conceded defeat in his battle to keep the Ireland second-row. The IRFU opted not to renew the 33-year-old’s national contract and the province simply couldn’t match what the Parisians were offering. “I'm disappointed for us but I think we have to be happy for Donnacha if that's what he wants to do,” Erasmus said. “He's served Munster well and I guess at his age he's got one big contract left in him. We made the best offer we could, which was for two years. “We offered him a two-year deal but I understand he has got a much better deal from Racing 92. I guess in the next few days we’ll understand where he stands. “Obviously he would be a great loss to us. He’s one of our stalwarts, really a Munster man. Meanwhile, Erasmus said Conor Murray’s chances of playing against Toulouse are rated at “50/50” as he looked to prove his fitness after damaging his shoulder while playing for Ireland against Wales. And he said the scrum-half will be given all the time he needs to recover in time for the game. “He's had the injury and then didn't play the next Test match,” he said. “Last week we had most of the international guys off against Zebre, gave them a rest and didn't play them. He's back in today training with us and we're going to give him until Saturday morning to see can he recover fully and hopefully he will.